Chauliodes pectinicornis, better known as the Summer Fishfly, inhabits much of the United States' Northeast and Upper Midwest regions. 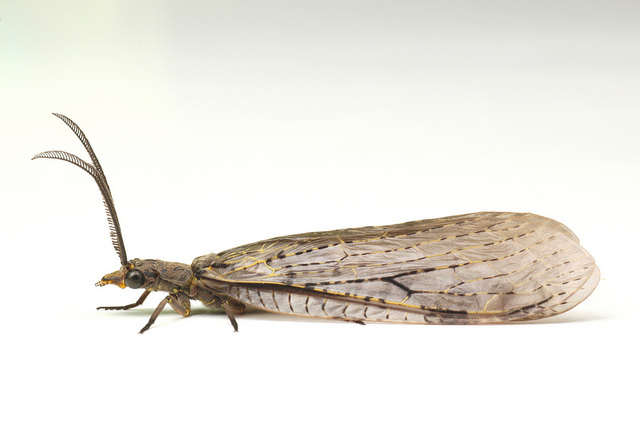 This interesting insect can be found near streams and rivers and could be living right outside your window! This website will take you through some facts about the Summer Fishfly including its classification, habitats, adaptations, and diet. 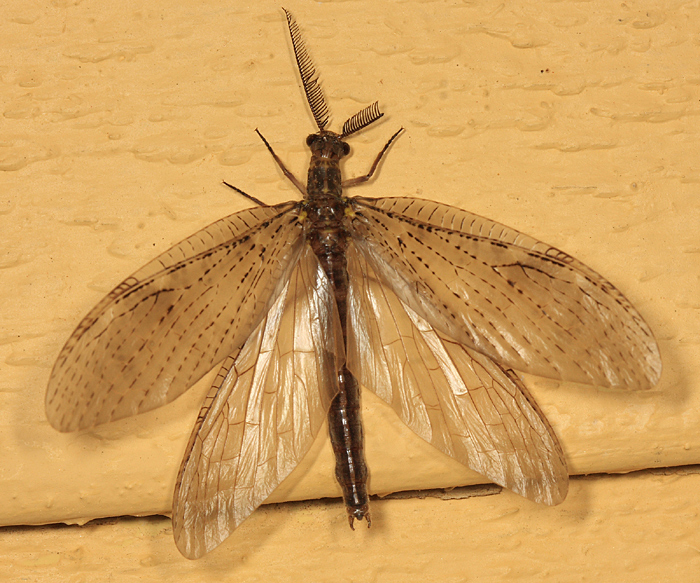 The Summer Fishfly is easily characterized by its large "lacewings" that account for much of the insect's profile. In addition, they possess pectinate antennae or "combed antennas," used as a sensory device. These fishflies are usually lightly colored, exhibiting a tan or beige coloration. When fully grown, they are fairly large compared to other North American insects and can become 21-46mm in length (about 1-2 inches), not including their wings (Schlager and Hutchins 2003). The Summer Fishfly can be seen generally near wet environments such as ponds, lakes, and calm streams in eastern and central North America. As the name implies, the Summer Fishfly is more prevalent in summer times from May-July unless they are in warmer year-round climates. In this case, they can be seen in both the spring and summer. A Summer Fishfly has an interesting life cycle as well. They follow a life style called complete metamorphosis. Eggs of the fly are laid in large masses, typically 200 to 3,000 eggs, near still bodies of water. Once hatched, the larvae crawl to the nearest water source where they thrive off of detritus or become omnivorous. Fishflies spend much of their lives underwater in the larval stage, lasting 2 or 3 years (Iowa State University Entomology 2012). Once large enough, the larvae leave the water and pupate near or underneath bark. The pupation process takes a couple weeks in which they morph into their adult self. The adults then hatch typically living for only a few days; just enough time for them to lay eggs.